A honey-sweet black tea with aromas and natural flavours reminiscent of melon for a mellow and soft cup. Our remarkable and lovingly flavoured Ceylon tea is delicately trimmed with green blackberry leaves and bright mango and kiwi pieces; conceiving a lightly sweet and honeyed-melon essence on the palate. 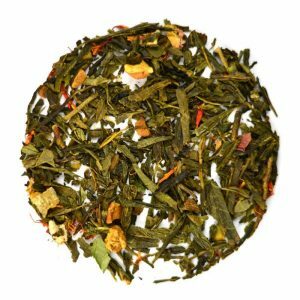 This kiwi melon black tea is tender in aroma and flavour, and has a refreshing character that makes it an ideal choice for iced tea. When brewed hot, a stick of cinnamon steeped and garnished with the tea allows for a hint of spice that will add new levels of flavour to this cup. Brew tip: Wonderful when garnished with a cinnamon stick. Also, try is as a latte! Black tea, mango and kiwi pieces, blackberry leaves, natural flavours.